Note: Park closed every Tuesday, except on Malaysian school & public holidays. Customer must present printed E-Ticket for the above product at Sunway Lost World Of Tambun (LWOT) ticketing counter in order to redeem their entrance wristband. For Malaysians, kindly present printed E-Ticket together with original MyKad/MyKid at LWOT ticketing counter upon wristband redemption. LWOT reserves the right to reject any entry that does not comply. Price differences will be charged for entry (based on online admission ticket price) in the event that identification was not provided. Tickets purchased are VALID FOR 30 DAYS from the date of purchase. Ticket valid for ONE (1) admission per day. Any unused tickets, no further re-validation or refund will be allowed. Pay-per-ride, Locker Rental, and other rentals please refer to LWOT official website (link). For your comfort and safety, all visitors are required to comply with the LWOT DRESS CODE when swimming or using the rides in the waterpark. Kindly refer swimming attire guide here. Full T&C about the ticket, in the event of a dispute, the English version shall prevail please refer LWOT official website (link). Write your Email address in the Checkout page Order Notes section, if you missed it during payment, contact us here. All confirmed purchase will receive E-Ticket via provided Email within working hours from 9AM-6PM (GMT+8). Bookings made after 6:00 PM will be processed on the following day. 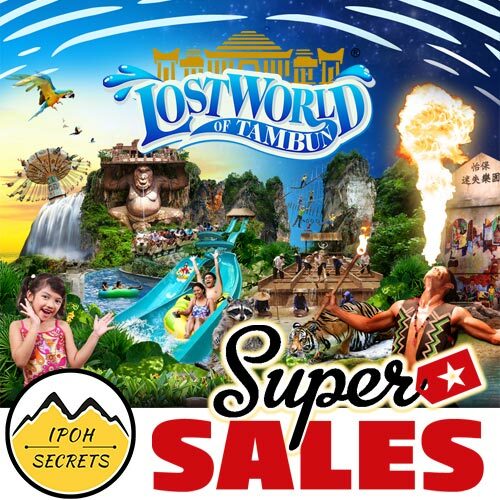 Head to the main entrance of Sunway Lost World of Tambun with printed E-Ticket issued by Ipoh Secrets to redeem your entrance wristband.